Whether you’re moving house or not, having a clutter-filled space makes life a whole lot less comfortable. If you’re planning on moving house though, clutter makes the whole process so much more difficult. You’ll be spending more time packing things you don’t need and you might even need to buy more boxes to pack the clutter! Although decluttering might seem like an impossible or even downright scary job, it really isn’t too hard at all. Especially if you have a good guide to follow like the one below. An important thing to remember throughout your day-to-day, however, is that you should do minor house cleans. This way things won’t build up. Throw away broken appliances right away, get rid of ripped clothes and certainly make sure you don’t have a junk drawer that gets more and more packed with rubbish. If you’re not sure you want to spend the time to declutter your home before you move or just in general, then we have some news for you. The more cluttered a home, the more expensive it becomes. Not only will you need to purchase more storage, but you might also be breaking furniture or flooring in your home with the added clutter. Additionally, a cluttered room is also a great area for bugs and insects to live in and you might need to spend more money hiring an exterminator. Now that we’ve gone over some of the risks and pros and cons, we can start outlining the best ways to get your house decluttered and ready to move out of or be liveable again! Take a look at our tips below. This step is usually pretty exciting for most people. Grab an iPad (or a notepad) and open up notes and take a walk around the house. As you look over everything you own, write down which items you want to throw away. A good place to start is in the appliance cupboard in the kitchen. When you have a healthy list of items you no longer want or use, you can move on to throwing them away or having a removal service come and get them. Although you’re probably looking to get the entire house decluttering done in a single day, it’s best not to. You might find yourself skipping things or ignoring rooms altogether because you’re too tired. On your iPad, simply write down a day next to each item and group each day together. This way you’ll have a clear outline of what needs to be thrown away and when. Then there’s no chance of burning out. After the first or second day of your decluttering, don’t give up! You don’t want to half finish a job and be back at square one. Keep powering through and you’ll be in love with the result. A tidy, clutter-free and more liveable home. If you’re worried you won’t have enough space in the bin or the car to put all the items, then make sure to call a service like 1300 Rubbish to collect the items for you. Once you have decluttered your home the idea is to maintain it so that your effort does not go to waste. 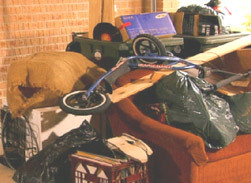 Regularly assess the number of items in your home and decide if it’s too much and if cleaning is needed. Think about scheduling a regular clean-out once or twice a year. One of the biggest reasons behind people stopping their decluttering early is the fact that their wheelie bin and car simply can’t take anymore. Deal with this issue from the start. Hire a skip bin or book a rubbish removal service to stop by your home and this way you’ll have plenty of space no matter how many items you’re throwing away. Finally, once your home is nice and clean and you’re either ready to move or excited to live in a nice, tidy home, you should also remember how the home got that way. Don’t go back to your old ways of being possessive and purchasing things for no reason. Have a plan in place for future purchases and keep everything to a minimum. This way you’ll be able to stop clutter build up in its tracks.